Our first priority is to meet basic human needs, but we recognize the importance of programs that go beyond the basics of food, shelter, clothing and safety. In addition to meeting basic needs, The Salvation Army strives to provide programs that will help children thrive during crucial developmental years - from pre-school programs and summer camps, to childcare and toys at Christmas. Our Salvation Army's Child Development Center provides kids' with early educational opportunities through a variety of programs. At The Salvation Army, we provide a school readiness center for children, ages 3-6. This is a California Department of Education state funded pre-school/day care center licensed for up to 60 young students. At the Salvation Army Child Development Center, we believe children flourish in the company of interested, loving adults who understand child development and teach children accordingly. Our programs are designed to foster exploration, independence and creativity. The Salvation Army Child Development Center provides parents with two safe and developmentally appropriate choices for childcare. The first program is a 3 hour program offered from 8-11am or 2-5pm, Monday through Friday, following the traditional school calendar. This is a school readiness program designed to prepare children for kindergarten. Many hands-on, multi-sensory activities, and large and small group activities are designed to develop the whole child. Our second option is general childcare for families who need quality childcare throughout the year. This program accepts children who are 3 to 6 years of age and are self-sufficient with toileting. 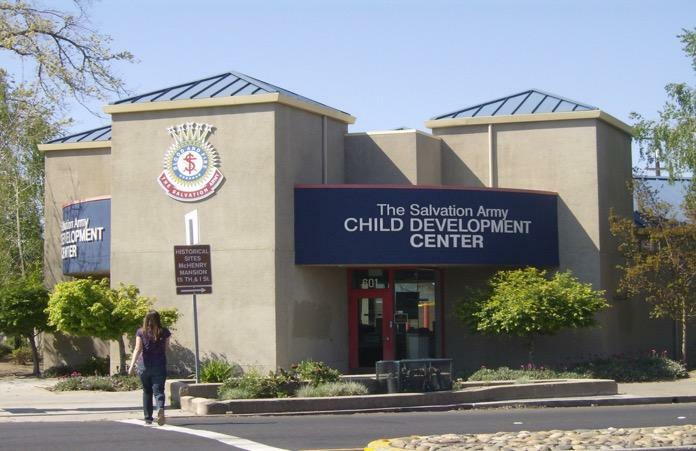 The Salvation Army Child Development Center is funded through the California Department of Education. Because of this, fees are determined based on income eligibility. A Wait List is maintained at the Center. Please contact us for more information regarding fees and the enrollment process. We are open from 6:45am until 5:30pm, Monday through Friday. All children must be picked up by 5:30pm or a per minute late fee will be charged. We provide breakfast, snacks and lunch for all children. A daily schedule of activities is posted in each classroom and available upon request. We are located at 601 I Street in downtown Modesto. Please contact us for further information or to volunteer.